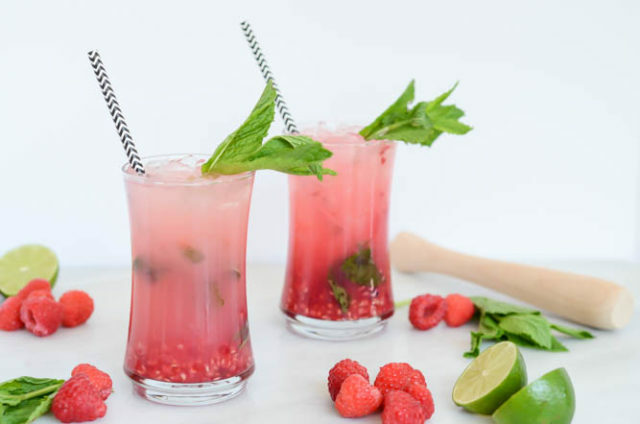 That’s exactly what this Fresh Raspberry Mint Limeade is. It’s the perfect drink for summer and, yes, in case you were wondering, you can easily booze it up 😉 Just add a shot or two of vodka! Throughout my pregnancy, I’ve been a big fan of acidic drinks with just a hint of sweetness. Whenever we go somewhere that I’m ordering a mocktail, if the bartender asks me what kind of drinks I like, my answer is always “Not too sweet!” I also tend to notice that baby gets more active when I have the juicy, acidic stuff, which is always exciting and fun. But regardless of having weird pregnancy cravings/tendencies, this Fresh Raspberry Mint Limeade is most definitely a winner. If you’ve been reading this blog for any period of time, you’ll know that I’m not a big fan of processed foods (including juices) and try to make things from scratch whenever possible. No, I’m not a health nut, but I do care about quality, unprocessed food and minimal preservatives and additives. The lemon- or limeade you’ll find at most grocery stores is often loaded with sugar, artificial dyes and who knows what else, so I always try to make my own as much as possible. And no, you do not need a truckload of citrus to make a decent glass of limeade. For example, for this Fresh Raspberry Mint Limeade, I only used about 1 cup of fresh lime juice, which is approximately a dozen limes. And the raspberries. Ohhhh the raspberries. Don’t they lend just the most beautiful color? I couldn’t resist snapping some photos of the limeade before stirring because of that beautiful layered look you get with the raspberries on the bottom, the limeade on top and the garnish of bright green mint, but you’ll definitely want to give the drink a good stir before drinking so you can get all the flavors to meld. As delicious as fresh limes and raspberries are, the two together can be pretty tart and acidic, so to sweeten things up a bit we use good ol’ simple syrup. We keep a stash of this brand on hand, but you can also easily make your own by boiling up equal parts sugar and water until you get a thicker, syrupy consistency. It’s a great ingredient on hand, even if you’re only making alcohol-free cocktails! The other thing I love about all citrus is how easy it is to juice! Whether you’re going for orange juice, lemonade or limeade, you can easily make it with a hand squeezer. No fancy juicer necessary. 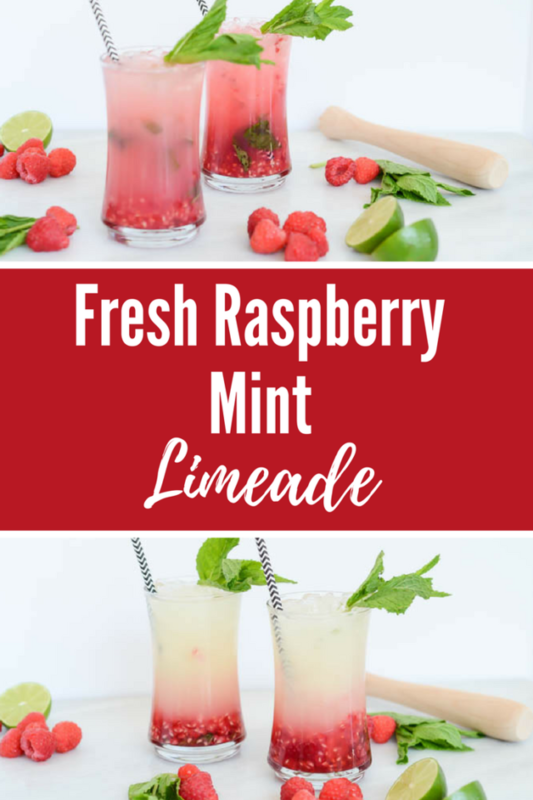 I don’t know about you, but we have no room whatsoever for any other appliances in our kitchen so, as much as I’d love to have fresh juice of any kind on hand at any given moment, I’m happy to settle for all the citruses, like this Fresh Raspberry Mint Limeade! 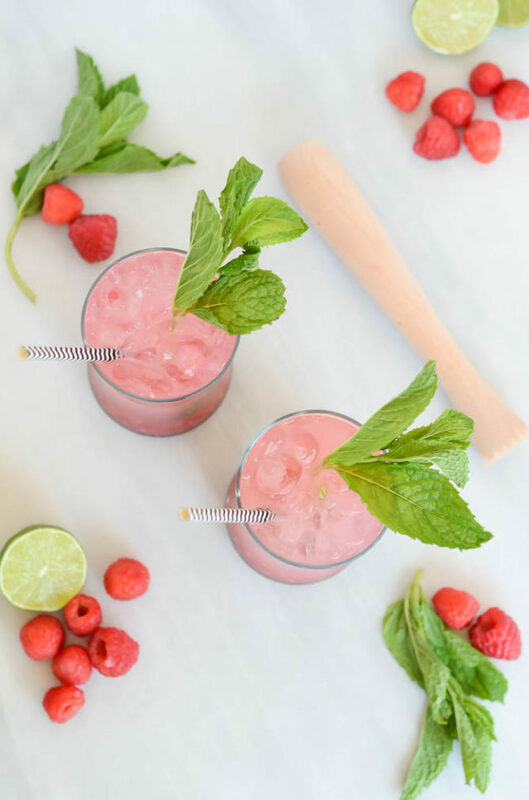 By this time you may be wondering how we work the raspberries, which are clearly not a citrus fruit, into the limeade and give it that beautiful pink color (it’s electric, I swear!) Well, my friends, that’s where we turn to one of our good ol’ bartending skills – muddling! This is one of my other favorite tricks for adding fresh fruit flavor (no pre-bottled, additive-laden junk) to a drink, and raspberries are soft and juicy enough to release all their sweet flavor with just a quick little mash in the bottom of your glass. And the mint, of course we can’t forget the mint! This is the perfect finishing touch and adds just the perfect hit of subtle flavor to an already refreshing drink. I mean, there’s no better way to make a mocktail fancy then to add some fresh herb-y flavor and a beautiful garnish, am I right? 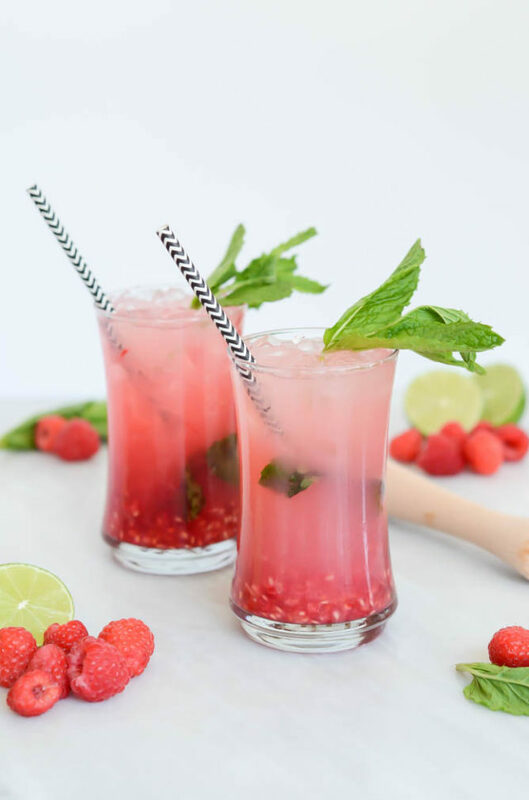 Now, it’s Friday, we’ve got two days of play ahead of us, and the weather is undoubtedly warm wherever you are (unless you’re in the Southern Hemisphere, that is) so what do you say we whip up some Fresh Raspberry Mint Limeade and call it a day? 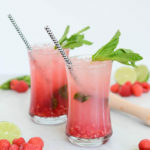 This citrus quencher is loaded with fresh limes and raspberries, with a touch of mint to really bring it over the top. Add vodka for a delicious cocktail! 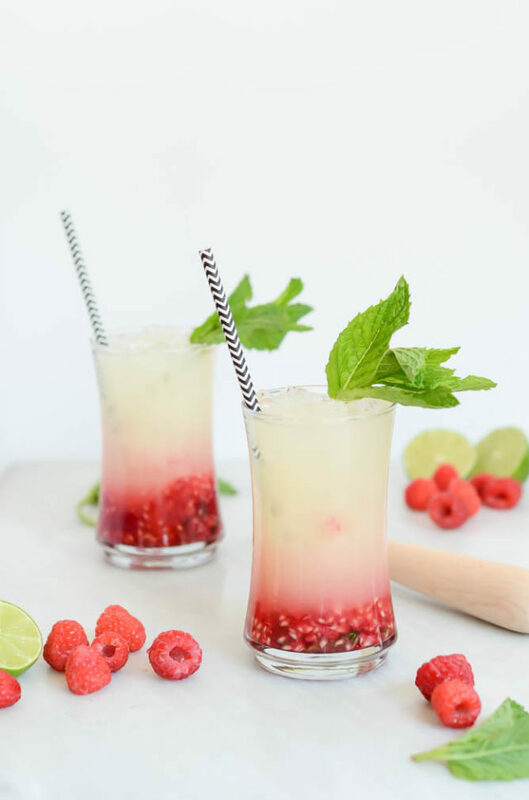 Divide raspberries, simple syrup and mint leaves evenly into the bottom of two highball glasses. Muddle ingredients in each glass until the raspberries release their juices. Fill highball glasses to the top with ice. Top with fresh lime juice. Garnish with fresh mint sprigs and enjoy!